These innovations are built on top of the unique simplicity of Albert, the UK’s highest rated invoicing and expensing app, and backed by the security of a fully authorised and regulated Starling Bank account. Freelancers spend a lot of time on stress-inducing bookkeeping and finance management. Up until now, data often sat in different places: transactions resided in online banking, invoices were in a manual invoice tool, while receipts were in wallets or lost. 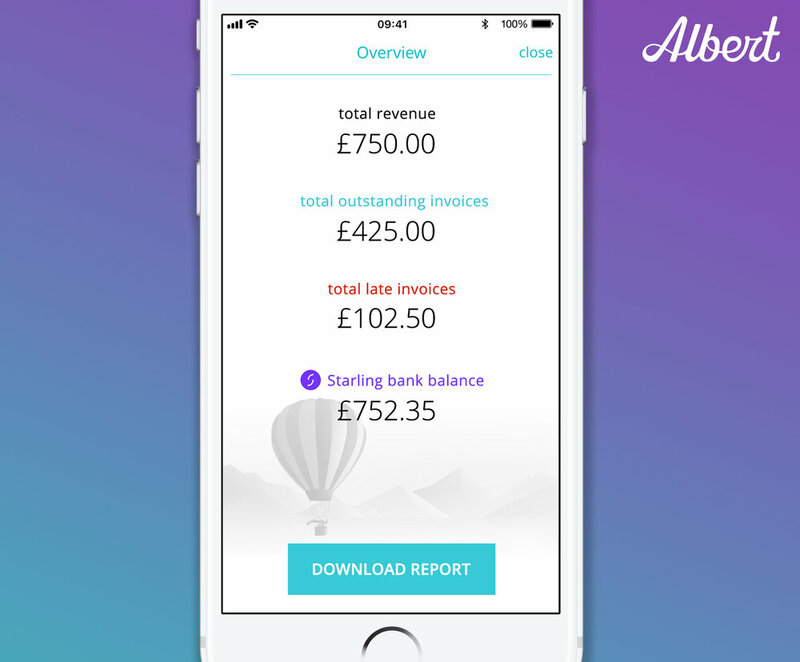 In an industry first, Albert and Starling are bringing together banking data, invoices and expensing in one mobile screen in real-time. Starting now, freelancers can always be up-to-date and accurate. 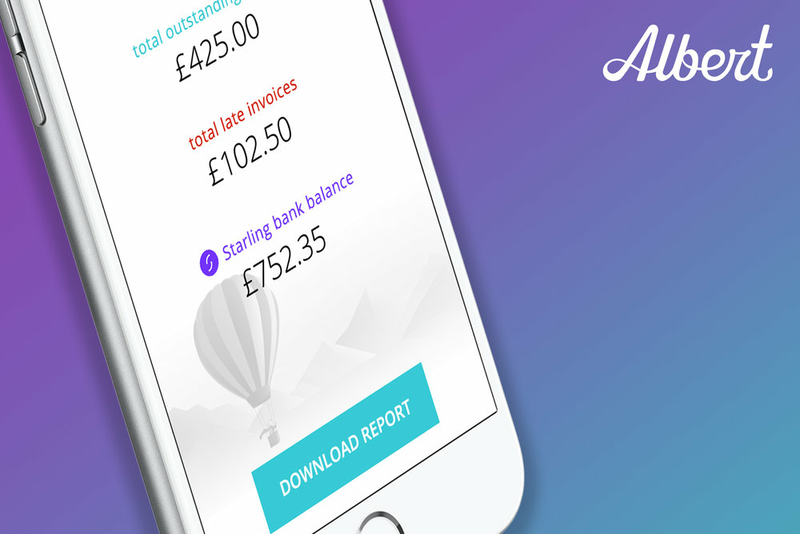 Albert and Starling automate freelancer’s mundane daily financial tasks. The integration simplifies matching your bank transactions with invoices, and automatically generates expenses just after your payment is sent. Furthermore, Albert’s one-tap reporting feature will automatically aggregate all essential data - including invoices, expenses and bank transactions - that accountants and tax advisors typically need. The Albert and Starling integration allows freelancers to do all their financial activities from their mobile. Users can now sign up and, if selected for this initial trial, will be able to track their bookkeeping, make payments and send reports, wherever and whenever they are. It’s the first solution of its kind to give true freedom and flexibility to freelancers. The partnership between Starling Bank and Albert will bring the benefits of PSD2 (the new banking regulation coming in January 2018) and Open Banking to sole traders and small businesses, in preparation for these new banking regulations. Unfortunately, the Albert and Starling integration is now closed. We will inform all our users when the feature is fully released. Albert is the best app freelancers hardly need to use. We believe freelancers should enjoy their freedom without worrying about the financial aspects. Albert gives its users a unique solution in their pockets that takes over laborious tasks, informs when needed and simplifies everything else. Albert is an innovative, fast growing technology company disrupting Business Finance Management for freelancers and small businesses. Backed by the investors behind Skype, Wix and Azimo, the company launched their platform early 2016 publicly, has been recognised as UK startup of the year, featured three times by Apple, and now is the highest rated finance app for freelancers in the UK App Store with over 1,000 five-star reviews. We’re a fintech business with a banking licence, fully regulated by the FCA and PRA, and were granted a banking licence by the Bank of England in July 2016. Our app, available for Android and iOS, was launched to the public in May 2017. Starling Bank is directly connected to major payment schemes, including Faster Payments, and MasterCard.